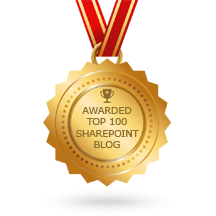 Being a SharePoint Site Collection Administrator (SCA) is a very important job with plenty responsibility that requires a high level of maturity. You don’t just make anyone a SCA, you need lots of SharePoint experience and understanding. These are super power rights that need to be learnt, understood and managed. This is all advanced use, so if you don’t understand what some of this means, you aren’t ready to be a SCA yet. There are dozens of tasks that need to be managed depending on the positioning of SharePoint, what you’re using it for and what you’ve got activated. This list covers the things that most organisations would need to use. You will see / have different options available under Site Settings depending on the version and license type of SharePoint you have. Some of these are also applicable to Foundation, SharePoint 2007 and Office 365. 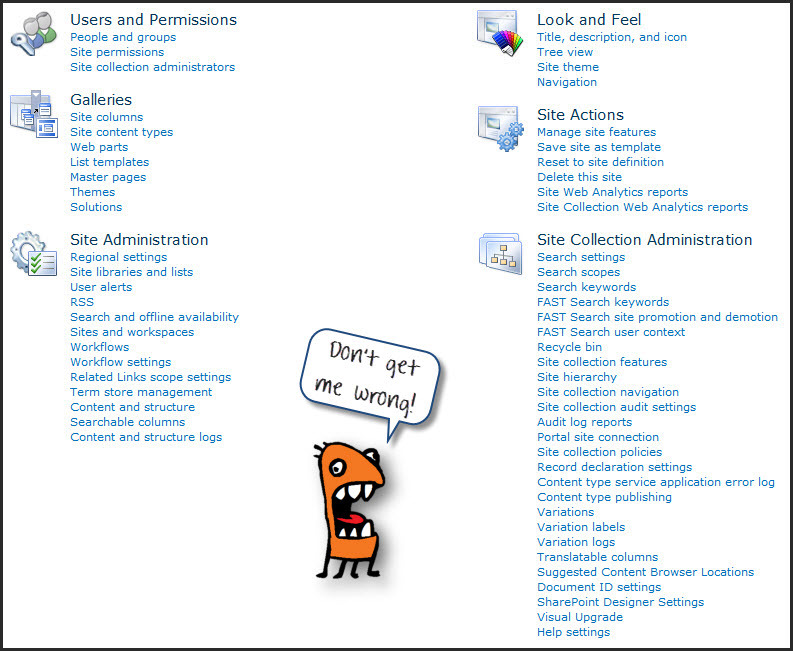 Site Permissions – you can only change item level permissions on a site collection level in 2010, (in 2007 you could do this on any site level). This means you will need to plan permissions properly. Do you want the members to be able to delete items? Do you want members and visitors to see the analytics reports, it’s handy to do. Change them here and communicate! Site Collection Administrators – check who else has full access to your collection and remove them if they aren’t authorised. Site Columns, Site Content Types, List Templates – you need to manage how these are created, use good naming conventions and descriptions, watch the ‘include content’ settings, manage the templates, delete the ones no longer needed. Site Collection Audit Settings – if you don’t tick all these boxes, you won’t be able to monitor activity on the collection. Regional Settings – the date and time format is defaulted to the USA, go here to change it to your country. It will filter down to all the subsites. SharePoint Designer Settings – you can allow people to use it or not, and specify what they can do with SPD. Search and Offline Availability – allow for search on the site and decide if search must be allowed on lists and libraries with unique permissions. Term Store Management – centralised metadata management, create and manage the terms that will be used in the collection. Site Collection Features – activate and deactivate features for the collection. (Put Publishing Site Features on so you can have the Navigation and Content and Structure options). Manage Site Features – once features are activated for the collection, features can be activated per site, manage them here. Portal Site Connection – if your site collection has been moved out of the bigger structure, you can add a link back to the main collection here. Remember to put a link back to this collection from the main collection. Storage Metrics – monitor how much space is being used and by whom. Search Scopes – define what sites can be searched by creating a scope of sites. Search Keywords – once you have enough content in the collection define best bets, synonyms, keywords and contacts to keep your most important content at the top of the search results. Site Collection Web Analytics – reports on the overall usage in the collection, keep an eye on the top level site to see if what you’re building is working and people are using it. (Not available in Office 365). Site Web Analytics Reports – schedule reports on a monthly basis to monitor activity per site, who visits, where they visit, etc. (Not available in Office 365). Document ID Settings – you can put a unique identifier in front of every document ID in this site collection to differentiate it from other site collections. (It will also prevent duplications in numbers). As a Site Collection Administrator it is your responsibility to manage the health of your collection, communicate all changes and governance rules clearly to your users, and ensure that your site owners go through proper training. Next Give Lets Collaborate’s Intranet a New Name and Win! It’s only SIte Collection Administrators that would see all of these. 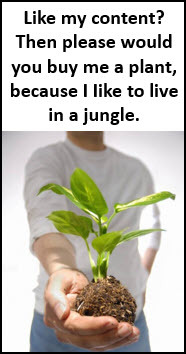 Site Owners would have limited access to links. You could edit the item level permissions of Site Owners to restrict this further.